The Shabby Tea Room challenge this week is Christmas in July. I love Christmas. I have been making cards the last few months for Christmas. For this challenge I wanted to make something with softer colors. I used two colors that are not really traditional Christmas colors but I have a feeling this year Christmas colors are going to be non-traditional, vintage-ish and muted. The Santa stamp I used is my all time favorite. I don't think the sparkle shows up as well as it should in this photo but it's like the 10th photo I took on the third attempt at photos so I'm sticking with it. Wow! Love this! That color palette is right up my alley. I love taking a non-traditional approach to things. Gorgeous stamp. Love the 3 panels in the background. thanks for joining us this week in the Tea Room. 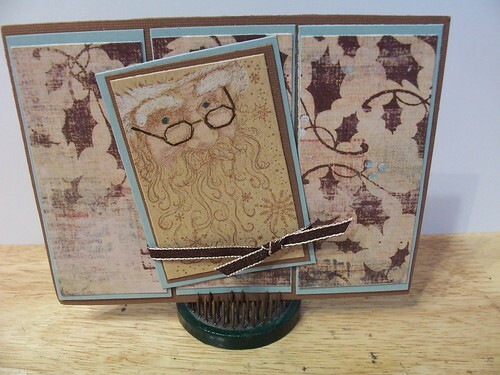 Great card,love the colours.That is also my fave Xmas stamp and comes out every year.